Taking advantage of iPhone 5S’s M7 built-in coprocessor, Nike+ Move App was showcased last month at the iPhone event. The app is now available for download from the App Store for the iPhone 5S users. As the M7 coprocessor can continuously measure motion data from the accelerometer, gyroscope and the compass, apps like Nike Move can access it thanks to the new CoreMotion APIs in the latest iOS 7 and track physical activity without engaging A7 chip, hence requiring less battery power. The Nike+ Move app for iPhone 5S uses the data from M7 processor to convert your movement to NikeFuel – Nike’s unit for measuring all kinds of activities. Nike+ Move app for iPhone 5S is available for free in the App Store. Use this link to directly download from iTunes link. Nike+ Move offers insight into when you move, how you move and where you move – and lets you challenge your friends to see who moves more. * Win the day by beating your NikeFuel average and watch your goal ring change from Red to Green. * See when you are most active throughout the day and how you’re doing compared to yesterday. * Move more often and win as many hours as you can throughout the day. * See how you moved through the day with a breakdown of running, walking, and other movement. * See where you’re moving and where you move the most each day. 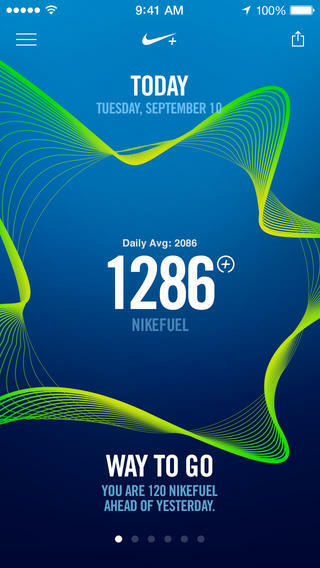 * Check out how you compare against your Game Center friends or other Nike+ Move users near you. * Note: iPhone 5S is required to get motivated with Nike+ Move.